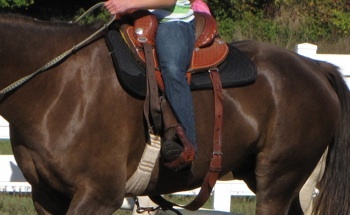 The cinch or girth is the piece of equipment that actually holds the saddle on the horses back. It can be referred to as a girth or a cinch. It is very important to have a cinch that fits the horse correctly. They come in many sizes but the most common size used is a 32 inch. 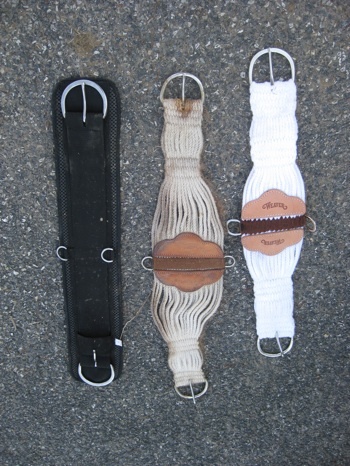 You can get many different types of cinches from a rope cinch (the white cinches shown above), neoprene (black cinch shown above) or different types of felts. It is a matter of preference or comfort for the horse when choosing the style of cinch. Be careful when using neoprene because it can rub a horse and cause sores. If you choose to use the neoprene, which I use, then watch your horse carefully the first couple of uses to make sure their is no rubbing. 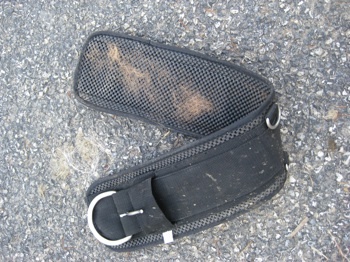 I have not had any problems with the neoprene cinch and it really depends on your horse. 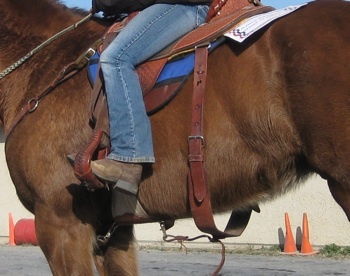 To tell whether it fits look to see how far the cinch comes up to the saddle on both sides. There should be a a couple inches of space between the saddle and the cinch. Also look to see how far up the cinch goes on the horses girth area, the area right behind the front legs is also called the girth which is where the name came from. Back cinches, bucking straps or back straps are also used on many western horses. This is a cinch that attaches to the back of the saddle and is not tightened all the way on the horse. Their should be enough room to fit your hand but not enough that the horse could get its foot up in it and tangled.